Burton Constable Riding Centre is situated in the grounds of the Burton Constable Estate, the mainstay of the estate being Burton Constable Hall itself, which is a historic stately home dating back to the 14th Century. The Riding Centre is a British Horse Society Approved Centre and offers daily or weekly residential or non-residential courses throughout the summer and during school holidays. 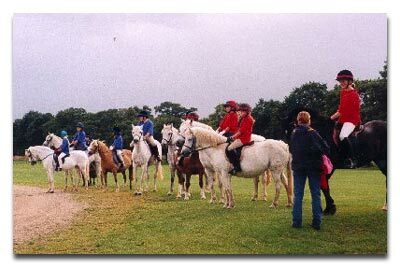 In 1995, Tom and Melanie Thompson moved to Burton Constable with their horses and began to run a thriving British Horse Society approved riding centre catering for riders at all stages. From teaching beginners through to training students for British Horse Society examinations and NVQs. In addition, they run a variety of courses for both adults and children at various times throughout the year. Tom Thompson is a BHSI with many years of experience in schooling horses and in training career riders as well as in teaching those who want to ride for pleasure. Melanie Thompson has been assisting Tom throughout his career, firstly as a groom, now as a secretary for Burton Constable Riding Centre and all associated events. This riding school was extremely excellent and did rise up to high standards. I attended this riding centre for 4 years from 2001 – 2005 and i learnt a lot here. Sadly recently it has been closed down as i believe tom has retired unfortunately, he will be truly missed though as he was a high standard teacher who did not take no for an answer.